Since we first wrote about Wayfindr on our blog, we’ve made some big strides forward, culminating in a recent trial of the system at Pimlico station on the London Underground. Testing with users for real in this ‘live’ environment surfaced new challenges and opportunities, and we were able to further validate Wayfindr. We continued our partnership with the RLSB Youth Forum, who worked with us to test the system as we installed it on site. Our role as innovation partners with London Underground gave us access to the station, allowing us to iterate and make improvements on site as we moved through the trial. Could vision impaired customers of London Underground navigate around the station safely without the need for human assistance? How would they feel about it? How would Bluetooth-powered beacon technology behave within the architecture of a tube station with large amounts of human traffic? In parallel, we were investigating what a good sonic-based wayfinding system should comprise of for vision impaired customers using public transport. 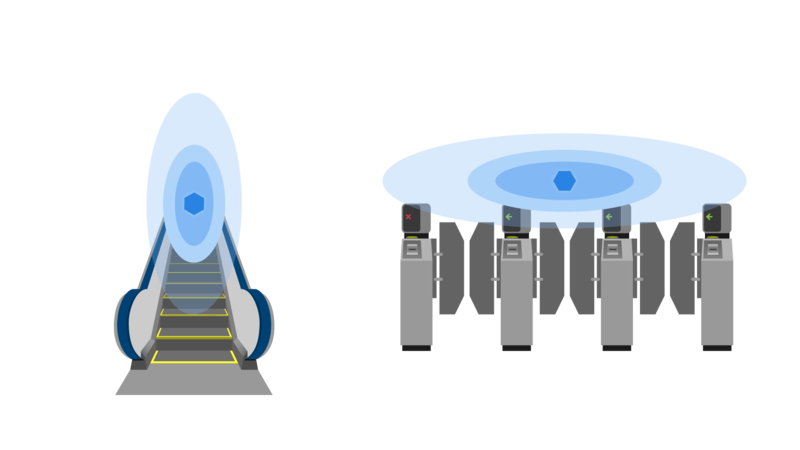 A standard system could ensure consistent user experience across all modes of transport wherever wayfinding technologies are present. What we did for the Pimlico trial is similar to the approach that we follow for any other project at ustwo – a user-centred, agile and iterative process. Less is more. Simple and concise instructions were preferred over frequent and absolute ones, and using instructions only at significant waypoints was an effective strategy as the station's unique sounds and a user’s instinct also helped navigation. It also proved that there was no need to communicate distance in metres or number of strides. Courtney, an RLSB Youth Forum member, said that the "instructions were clear. My instinct also tells me probably this is the way to go." Clear terminology is essential. Transport authorities use different terminology when they refer to specific aspects of their service, and this may not be understood by their customers. As an alert to upcoming instructions we used a generic beep sound. Using beep sounds to attract user's attention and alert them to new instructions proved very efficient for navigation. We also found that intermediate feedback is very helpful, along with information about the number and direction of stairs. When the distance until the next checkpoint is great, users need some intermediate feedback for reassurance that they are still on the right track. Computer-generated speech is welcome. Although we had recorded 3 human voices as an alternative to the computer-generated voices used in assistive technologies, we found that users preferred to hear generated speech. Using computer-generated speech also allows us to be much more flexible, quickly responding to changes in station layouts, for example. During the trial we found that capturing the absolute user’s position wasn’t necessary. Initially, we tried to install beacons in a way that would allow us to have an absolute positioning system through triangulating a user's smartphone location. After trying out the prototype, however, we understood that beacons are needed only at significant waypoints in the user's journey. Thus, beacons were placed individually, or in clusters, to create regions that would trigger a spoken instruction. We also needed different beacon orientations for each purpose. The Estimote beacon antenna orientation affects the radio wave shape emitted in the space. 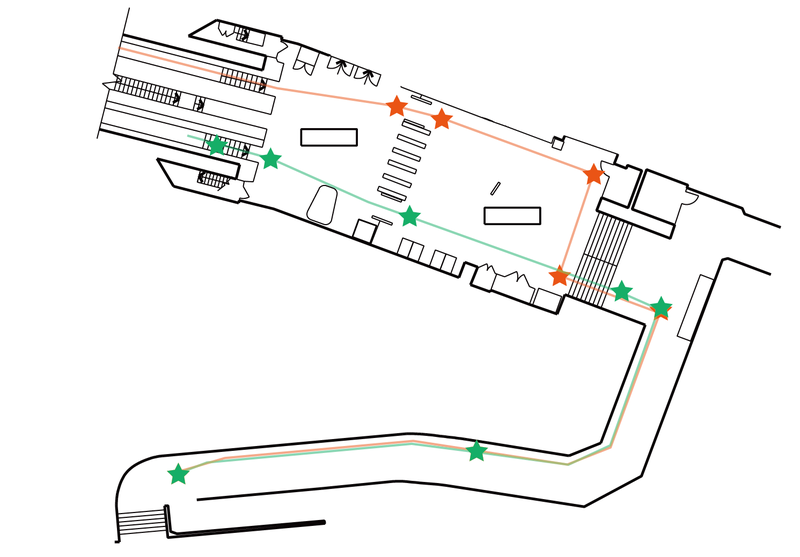 During the trial we experimented with Estimote beacon orientation to define the appropriate wave shape for each station area. Beacon placement is important. They were positioned on ceilings to maximise signal exposure, especially through large amounts of body mass. Their placement was particularly important at escalators and long hallways where users need a gentle reminder about their position. The beacon signal pulse also had to be increased – eventually we pushed it up by 10 times to maintain accurate location data. The feedback we got from users was generally very positive. There were some constructive points that we will need to be address in future trials and iterations of the system but, overall, participants who were a little insecure at the beginning of their trial sessions ended up feeling that the app was reassuring and that they could navigate with confidence in the station. Wow! That was literally like someone guiding you through the journey. London Underground currently offer a turn up and go system; vision impaired people turn up and request assistance to navigate a tube station. A London Underground employee guides them to or from the platform level, allowing them to complete their journey. Once trials and development are fully complete, the Wayfindr user can expect confident travel across the London’s transport network. We hope the service will make it easier to get independent access to work and to socialise. There is no need for expensive bespoke technology, meaning the barrier to adoption is very low. Wayfindr can be used with the technology most people already have. Wayfindr is an augmentation to existing systems, and isn't meant to replace mobility aids such as white canes or guide dogs. When Wayfindr is fully installed we will be one step closer to having fully inclusive transport systems that are accessible to more people. Our team is now working closely with RLSB and London Underground to define the next steps for Wayfindr. We are aiming to try it out with multiple modes of transport, using various technologies to complement beacons for more accurate navigation. It’s an exciting opportunity for us to work closely with London Underground as innovation partners towards an equally accessible transport network. The multidisciplinary team working on this trial were Georgios Maninis, Maya Bonkowski, Keisuke Saito and Umesh Pandya.